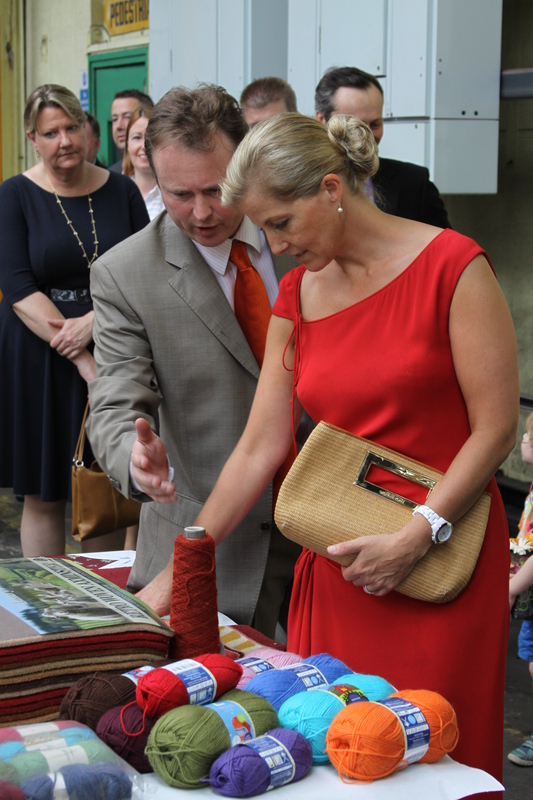 On 24th July, the Countess of Wessex was given a tour around the mill at Harrison Gardner, as part of her continuing support for the Campaign for Wool. She also visited a number of other manufacturers in Bradford, including the British Wool Marketing Board, hoping to raise awareness of the valuable role that wool plays in a range of products across the world. The Countess showed a great interest in the skill of the dyeing process involved inproducing quality wool carpets and hand knitting yarns. 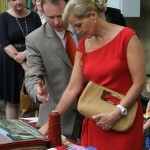 Samples of carpets and hand knitting wool that have been dyed by Harrison Gardner were put on display for her to see. Brothers Jonathan and Daniel Harrison, joint owners and directors, discussed with the Countess of Wessex how the company continues to maintain its position in today’s challenging and evolving market. This is done through a hands on approach, meaning a daily involvement in colourmatching to ensure maximum efficiency and quick turnaround times, thus offeringan unprecedented service to its customers. During the tour around the dyehouse, the countess was able to see Harrison Gardner’s wide variety of over 35 dye vats,from the 5kg machine to the linking device, where up to 2000kg of the same colour can be dyed at one time. As commissiondyers, Harrison Gardner holds all of its customers’ yarn in its warehouse so it can fulfil orders very quickly, on shade and on time. The company has a wealth of knowledge, technical expertise and a loyal workforce, and Daniel explained to the countess that the fourth generation family business is over 110 years old. Through this proficiency and experience, Harrison Gardner hopes to see its business flourish and develop further in the future.